The concept of “business intelligence” is a misnomer, depending on where you work. Even with ubiquitous connections and vast storage, finding data about a business client, sales lead, company address or just about any needle in a haystack is a major challenge. Data Flow: Flip through the cards at the bottom of the screen in QlikView—just like you would in OS X’s Cover Flow view—to see reports on account info, sales trends, and other business data. QlikView for iPhone from QlikTech works with QlikView enterprise-class (and PC-based) business intelligence software, offering a way to flip through records in an interface that mimics iTunes’ Cover Flow view. Amazingly fast, the free app is a solid step toward better mobile access to enterprise data. Part of the issue with ERP (enterprise resource planning—a technology for sharing business information) is that systems by Oracle, IBM, and Microsoft were never really designed for smartphones. In fact, in my past life as an IT manager for a Fortune 100 company in the late ’90s, our ERP system was hardly even aware of the Internet, let alone mobile devices. QlikView shows how fingertip access to a vast data warehouse can work. On the iPhone, you touch a report template (a QVW file) and then drill down through a list of reports. For example, in a Salesforce.com template, you can view sales leads, account info, sales trends, and several other reports—all tied into a remote QlikView server. When you access a report, you will see cards on the lower portion of the screen. You flip through them (a la Cover Flow) to see reports. There’s a search box, and you can quickly exclude data or perform a search. And, really, that’s about it—QlikView is a viewer and not a report generator or creation tool. QlikView has three features that take advantage of the iPhone. When you turn the phone into landscape mode, the app switches orientation automatically. If you find a field you want to remove from view, you can shake your iPhone or iPod touch to remove it. Finally, you can use a template that reads your current location (via the device’s location features) and then shows you data relative to your current position—client info in your area, for example. The interface for this last function is rather limited: it just shows you the GPS coordinates, so there is no map overlay. Overall, the viewer is speedy and runs smoothly. However, there were a few times when QlikView would stall out for about a minute, likely processing all of the records in the database. I never had any outright crashes, and the stalling was rare and intermittent. Like any viewer app—such as Daylite Touch ( ) and Oracle Business Applications for iPhone—the real power comes from the data you collect in the main database. A poor database leads to poor business intelligence on the iPhone. So, the value of the app really depends on how you are using ERP. QlikTech does not offer a Mac version of its QlikView server, because of how it integrates with existing ERP systems on a PC server. That said, QlikView is bare-bones in a good way: it just spits out the data you need to make business decisions—no frills and no spills. 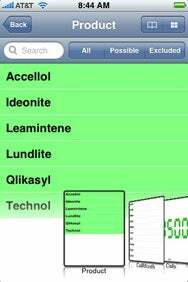 QlikView is compatible with any iPhone or iPod touch running the iPhone 2.x software update.